All the time we hear about diabetes, the risk it means to health and the difficulties they imply for the lifestyle of those who suffer from it. 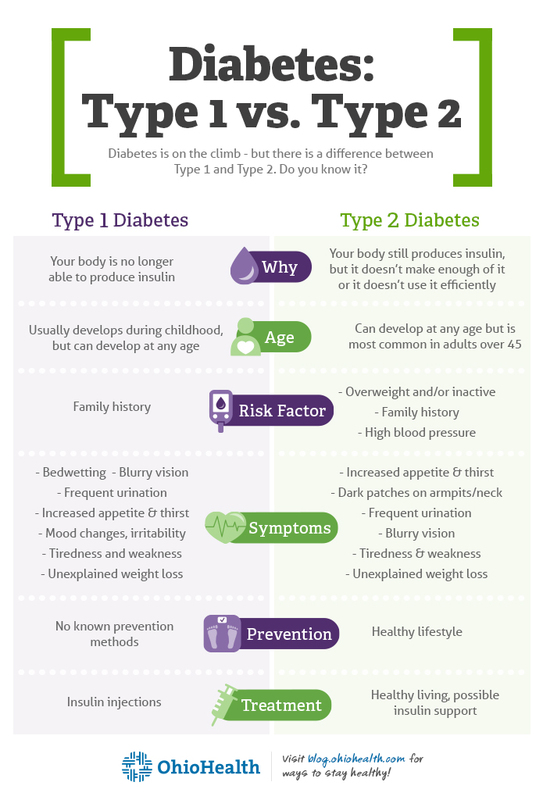 We all know, in addition, that there is type 1 and type 2 diabetes, but what is the difference exactly? Why is this distinction so relevant? Can all people suffer from one and the other? We will know more about this disease and we will see what differentiates both types of diabetes. Type 1 diabetes, or insulin-dependent diabetes, is the least common and usually appears during childhood, adolescence and the first years of adulthood. It does not necessarily have a genetic origin. In patients suffering from this type of diabetes, the pancreas does not produce the insulin necessary for the body cells to absorb glucose, which translates into high levels of blood glucose (hyperglycemia). The fundamental characteristic of this type of diabetes is the autoimmune destruction of beta cells, which are necessary to convert sugar, starches and other food into the energy necessary for daily life. The type 1 diabetes symptoms are abnormal thirst and dry mouth, extreme tiredness, constant appetite, sudden weight loss, slow healing of wounds, recurrent infections and blurred vision. Once the disease is diagnosed, the person should begin to inject insulin regularly, usually several times a day, depending on the energy needs. In addition, the treatment of insulin must be accompanied by a strict diet low in sugars, starches, and fats. Type 2 diabetes is the most common and usually occurs in middle-aged adults. In those who suffer from this type of disease, the pancreas works, but it does so poorly, producing little insulin or low-quality insulin that cannot be used correctly by the body. The result is similar: it produces an abnormal blood glucose level. The symptoms are similar but may take a long time to appear, so it is very difficult to diagnose. In synthesis the basic difference between both diabetes types is that in type 1 the pancreas stops working and does not produce insulin and in type 2 the pancreas works but does not produce enough, or produces too much but of low quality; all this translates into the same fundamental problem: the high level of blood glucose, which gradually deteriorates all the cells of the body. The diabetes causes are not completely known, but among the most studied, especially for type 2 diabetes, are some such as obesity, poor diet, lack of physical activity and family history. Now that we know the difference between both diabetes types, it is worth making a final reflection about it. Diabetes is a serious chronic disease that alters all aspects of a person’s life. While the symptoms and treatment of both types of diabetes are somewhat different, it is important to be clear that they are equally serious. A correct diet and physical exercise are the best ways to avoid the development of this disease, however, there is a large genetic component that unfortunately we cannot avoid. In any case, the treatment must be equally rigorous since a manifestation of this disease, a diabetic coma, can be fatal.